We are proud to announce a new Blackvoxel Version and a very important change in regarding the access to the Blackvoxel Binary Executables. The main technical feature change is the creation of Gamemodes. The game has been split into two gamemodes : Adventure and School Mode. From now on, accessing the executables files now require payment for the Adventure mode version. A "School Mode only" version remain availlable without payment. Blackvoxel needs to grow and that's why now the team decided to change the access to the Blackvoxel Binary Executables. 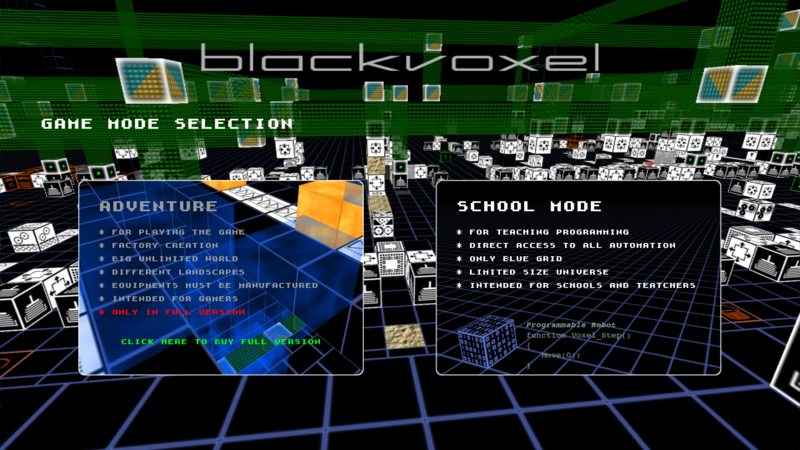 Blackvoxel stay a libre software under the GPL V3+ licence.